Gettysburg witnessed the Civil War’s biggest and bloodiest battle, "take a moment at each place and really visualize in your minds eye what went on there." There is no doubt that "Gettysburg is a special place, indeed it is hallowed ground. Just being there is really powerful in a way that defies description." When visiting, "spend at least two days here, four days might be better." 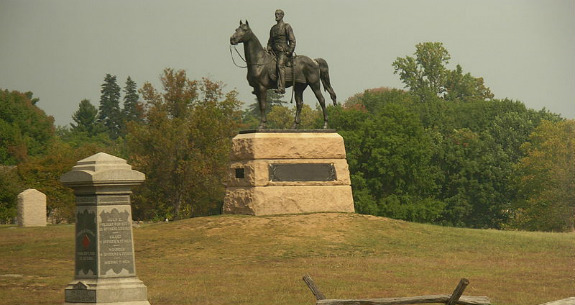 There are approximately 1,328 monuments, markers and memorials at Gettysburg National Military Park. "There is so much to see and absorb and it is one of the best managed battlefields." Visit their website to plan your trip. Please be aware that ticks are common to the Gettysburg area. Reduce your chances of getting a tick-borne disease by using repellents, checking for ticks, and showering after being outdoors. If you have a tick bite followed by a fever or rash, seek medical attention. Keep in mind that it can get very hot with no protection from the sun. It is advised to dress comfortably. Apply sunscreen generously and repeatedly throughout the day even if it is overcast. Peak season: March - October. School Field Trip Days are usually between April - Second week of June. If you are visiting during a peak period: Try to get their very early in the morning or late in the afternoon. It is usually most crowded in the middle of the day. If you go during the anniversary week (Jul 1-3), you will have the opportunity to see a reenactment event. (Kristen DeFreez Warr) The reenactment can be watched for free. However, if you want a better view, buy the tickets as it puts you in the viewing stands. Entrance to the park, National Cemetery, or park buildings are free. However, there is a fee to enter the Museum and Visitor Center exhibit galleries, film and Cyclorama program. Save time by buying your tickets online. This is especially useful when visiting during peak season. There are different ways to tour the park, you may opt for a self-guided tour, purchase an audio tour, get a Licensed Battlefield Guide service or join a Licensed Battlefield Guide bus tour. If opting for a self-guided tour, you may download the Official Map and Park Guide or ask for a copy in the Visitor Center. Audio tours can be purchased and/or rented at many local businesses and may be taken through the park at your leisure. Plan to spend at least two hours on your tour with an audio tape. Approximate costs range from $10 to $25. If hiring a Licensed Battlefield Guide for the tour, call ahead and make a reservation in order to get the date and time you want. Start your visit at the Museum and Visitor Center where you will find the National Park Service Information Desk, Visitor Center activities, ticket sales, Museum Bookstore, Refreshment Saloon, and restrooms. Backpacks and big parcels are not allowed inside the Museum and Visitor Center. Leave them in the trunk of your car. Save your tickets so you can enter the museum again later in the day. Visit the David Wills House where Lincoln stayed the night before his famous address. Ask for the Activity Guide for Junior Ranger Candidates at the information desk in the Visitor Center. Complete at least three of the seven activities in the booklet, return it at the information desk where a park ranger will review your book with you. If successful, you’ll receive a patch and certificate making you a Junior Ranger at Gettysburg National Military Park. The park is very big, prepare by bringing snacks and water in a refillable drinking bottle for the kids. Drinking fountains are available at the Museum and Visitor Center and at selected sites on the battlefield. Kids will love the Devil's Den and Little Round Top. Monuments and cannon were placed to honor the sacrifices made by those organizations. They are irreplaceable historic objects protected by Federal law. Please help preserve them by not climbing, standing or hanging on them. Gettysburg was a turning point in the Civil War, the Union victory that ended General Robert E. Lee's second and most ambitious invasion of the North. Often referred to as the "High Water Mark of the Rebellion", Gettysburg was the Civil War's bloodiest battle and was also the inspiration for President Abraham Lincoln's immortal "Gettysburg Address".